Subject: Revision of rates of Allowances -extension of Government decisions on the recommendations the 7th Central Pay Commission in respect of employees of Quasi - Government Organizations, Autonomous Organizations, Statutory Bodies set-up by and funded/controlled by the Central Government - regarding. 2. The decision of the Central Government on the recommendations of the 7th Central Pay Commission in regard to allowances in respect of Central Government employees have since been announced as per this Department's Resolution No. 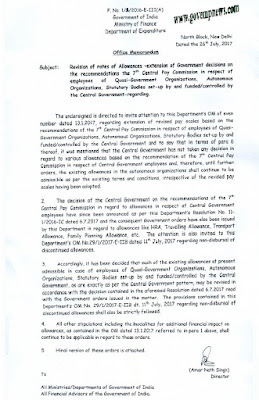 11-1/2016-IC dated 6-7-2017 and the consequent Government orders have also been issued by this Department in regard to allowances like HRA, Travelling Allowance, Transport Allowance, Family Planning Allowance, etc. 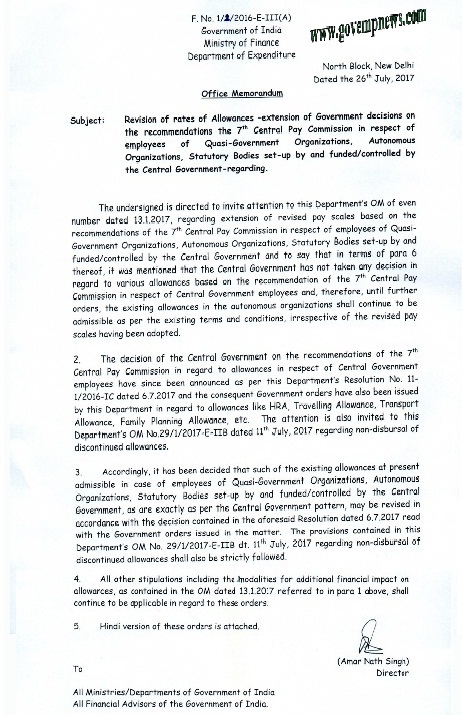 The attention is also invited to this Department‘s OM No.29/1/2017-E-IIB dated 11th July, 2017 regarding non-disbursal of discontinued allowances. 3. Accordingly, it has been decided that such of the existing allowances at present admissible in case of employees of Quasi-Government Organizations, Autonomous Organizations, Statutory Bodies set-up by and funded/controlled by the Central Government, as are exactly as per the Central Government pattern, may be revised in accordance with the decision contained in the aforesaid Resolution dated 6.7.2017 read with the Government orders issued in the matter. The provisions contained in this Department’s OM No. 29/1/2017-E-II.B dt. 11th July, 2017 regarding non-disbursal of discontinued allowances shall also be strictly followed. 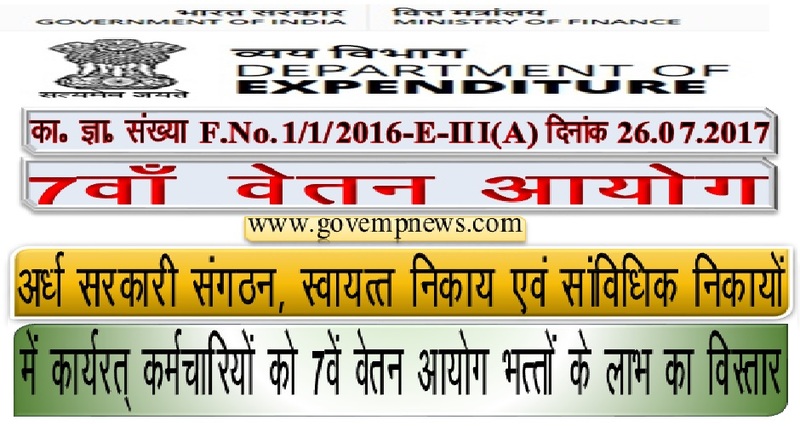 All Financial Advisors of the Government of India.